Help the Chancellor uncover some new information at a Worm Cult lair. Abnur Tharn seeks an audience with me away from the Harborage. I should see what he wants. Travel to the Mages Guild in Vulkhel Guard, Daggerfall or Davon's Watch. Activate the three Speaking Stones in the Worm Cult lair. Talk to Varen in the Harborage. Upon completion of the last quest, you should get a quest telling you to go to the Mages Guild in your alliance's first major city (Vulkhel Guard, Daggerfall or Davon's Watch). Inside the guildhall, the quest will update; now you need to talk to Abnur Tharn. Tharn is dressed like a mage in blue and white robes. Tharn questions why you trust Varen and tells you about Varen's plan to re-form the Five Companions. Sai Sahan is special, not only because he is a missing companion, but because he knows the location of the Amulet of Kings. 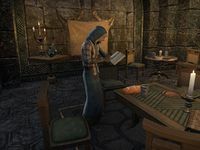 Depending on your faction, Tharn will tell you that Mannimarco keeps his important documents in Wormroot Depths (Aldmeri), Norvulk Ruins (Daggerfall) or Knife Ear Grotto (Ebonheart). You agree to meet him inside the secret Daedric lair. You can choose to ask him about himself or what he will do now. He is from a family of advisors and politicians. His daughter, Clivia, the Empress Regent, along with his nephew, Javad, are devout servants of Molag Bal. He laments the loss of his family's name from the history books due to his defection, but he says he remains focused on ensuring the survival of the Empire. "I will find the amulet, one way or another." Inside the lair, you need to find and use three Speaking Stones. These show a brief projection of Sai Sahan and two of Mannimarco. Talk to Abnur Tharn. The Halls of Torment is Coldharbour's most nefarious prison, whose prisoners face apparitions of things they fear the most. He will need to do some research before you can enter the Halls, so he asks you to go to the Harborage and tell Varen what you found. Talk to Varen in the Harborage. He will help Tharn look for a safe way to break Sai Sahan out of the Halls of Torment. He gives you a reward. Prior to the One Tamriel update, this quest could not be started until level 25. A small Daedric creature told me to go to the Vulkhel Guard/Daggerfall/Davon's Watch Mages Guild. It must be one of Tharn's servants. I arrived at the Mages Guild. I should speak with Abnur Tharn. 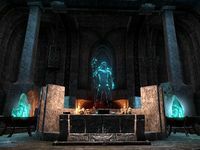 Abnur Tharn has asked me to travel to a place called the Norvulk Ruins in Stormhaven/Wormroot Depths in Grahtwood/Knife Ear Grotto in Deshaan, which he believes to be a place that Mannimarco keeps a cache of secret information. I appear to be getting the last bit of information from the speaking stones. I should wait until everything plays out and is revealed. I read all the books. I should talk with Abnur Than again and see what he has to say. Objective Hint: If I leave the cache location, Tharn will head back to the Mages Guild. Abnur has suggested that I return and tell Varen the news while he continues his research. I should finish up my business with Varen Aquilarios.